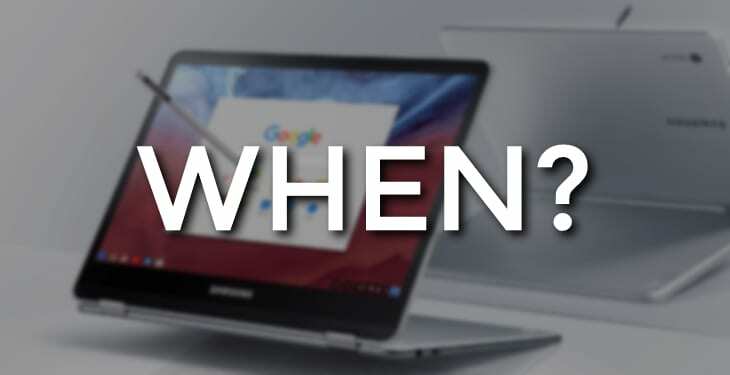 As we mentioned in an article earlier this week, the biggest question around the Samsung Chromebook Pro at this point is simple: when? When will it be made officially official? While we don’t have a 100% answer on this, we have a really good reason to believe we can at least nail down a window. Now, we won’t act like we didn’t make these suppositions before. We did and we missed. We did, however, hear rumblings of a delayed flagship device in the fall and weren’t sure which device was in questions. We feel confident the Samsung Chromebook Pro was that device. So, our original assumptions were actually right on point. There’s not been any official statements about a delay, but between Samsung’s Note 7 issues and the slower-than-expected arrival of Android Apps in the Stable Channel of Chrome OS, the reasons for a delay are easy to see. As we mentioned here and here, regardless of how badly we want this device to finally break cover, it is totally understandable that it hasn’t yet. The news I have to share isn’t going to go down well, either. What you likely want me to say is that Samsung is going to miraculously drop this device on us before Christmas, blow everyone’s minds, and sell tons of them for the holiday in the last few weeks of December. That, unfortunately, is highly unlikely. Let’s quickly talk about why. First, a release would take a week or two after announcement. Even with high profile devices like iPhones and Pixels, announcement to shipping takes a bit of time. Chromebook rarely see this quick turnaround. Even if Samsung announced it today, it wouldn’t be available until mid-December and would completely fumble a holiday launch. Second, as we’ve mentioned, Samsung isn’t launching this thing without stable Android support. There’s just no way. From what we’ve gathered, Chrome OS 55 didn’t add much to the story in terms of Play Store support. If you’ve been following along, Chrome OS 55 should show up next week and we’re not expecting a lot to change. The Dev and Beta versions didn’t do much to change the number of devices with Android, so it is unlikely it will do so in Stable. My secret hope is that 55 at least gets the core 3 (Pixel, R11, Flip) out of Beta status in terms of Android support. I have no clue if that will happen. I also hope that the Android container might just make it to 7.1 for at least those devices as well. All hopes, no facts there. Chrome OS 56, however, did bring a substantial amount of change to Chrome OS. With material design cues, many, many more Chromebooks getting Android support, and some other fun tidbits, 56 is a substantial step forward. It seems that, with release 56, Chrome OS is looking to bring Play Store support to many – if not all – Chromebooks on the list of supported devices. As 56 makes it to Beta Channel in the next week or so, developers now have all of December and all of January to really iron out little issues across all the supported devices. It looks like 56 could be the version where Android fully arrives for Chrome OS. And, because of this, it leads us to believe that the Samsung Chromebook Pro will find itself being released in that window. If you look at the official Chrome release dates, you’ll notice that 56 also has a bit of an extended development. Most releases of Chrome OS follow a 6 week schedule. They’ve stuck to this for a long, long time. But, if you do the math, you’ll see that the time between 55 and 56 is actually 8 weeks. Why else would they be scheduling themselves some extra wiggle room? Your thoughts are likely the same as mine: Android support. Lastly, many of the latest commits for ‘Kevin’ (Samsung’s Codename for the Pro) are being submitted to both the Chrome OS 55 and 56 branches. If it was coming in the Chrome OS 55 window, there’d be little need for so many commits being submitted to the Chrome OS 56 branch. Like I said, you may not want to hear it. I don’t want to, either. The facts are pretty clear in this, though. What I’m expecting is an early January announcement and a late January/early February release. In the grand scope of things, that’s not that long. December will go by quickly with all the holiday action and it will be January before we know it. Hopefully we hear something official early in January and then we can at least begin waiting with some real communication from Samsung.